This is so me, I'm in!! How many times have you told yourself, have been told, or believe the following about standing out online? What You Think, Believe, Say, And Keep Affirming About Yourself Is The Very Thing That's Keeping You From Shining On Screen. Your business will sky rocket once your confidence does. I’ve been where you are and I know I can help. It’s my mission and passion to help other women entrepreneurs just like you to push past fear and shine on screen. Why you may ask?... Because I’m a woman entrepreneur just like you! My story is probably a lot like yours: I was always scared of what others thought of me. 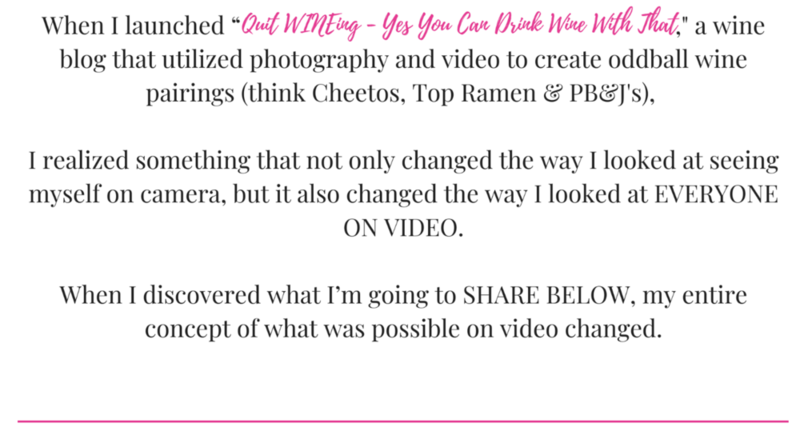 After all, I was dressing up in costumes on my wine blog in order to hide and not let people see the real me. I struggled with feelings of not being pretty enough, smart enough, talented enough, or worthy enough for people to want to pay attention to me. And the biggest problem was - I lacked the clarity to see that I didn't need to be perfect. I didn’t have to hide behind costumes or try to be funny. I only needed to be authentically me. Eventually, I quit. I gave up on my big dreams of being a wine television star. And I became incredibly lost and depressed. Then one day, I sought some help. The business folks taught me about mental blocks and mindset. The marketing folks fed me techniques and tactics. Everything I learned was an important piece of the puzzle, but for years I sat back waiting for the right moment to get back in the game. There’s a lot of misinformation about what it takes to film successful live videos that grow your business (a lesson I learned the hard way) and if you go about it the wrong way, you’ll struggle. I’ve helped many women just like you to use Live Video as a successful tool to grow their business (and actually love being on camera!). Just 3 months ago- I was frustrated with going Live and not having the forward progress with my business or any kind of organization to my social media posts. For the past 10 weeks, Courtney has been SHINING me up!! Her coaching has launched my business to the next level & has helped me with videos and posts that I would never have dared to put out. Yes I Want To Shine On Screen! Within weeks you could learn how to stand-out on video, increase your brand's visibility, increase your opportunities to work with new clients, increase your engagement on social media, create connections, build your brand's know, trust and like factor, and grow your business, which means more profits for you! That’s what the Shine On Screen Academy will do for you! AS A BONUS FOR SIGNING UP TODAY I WILL BE GIFTING YOU MY TIME TO SHINE 5 MODULES + BONUS WORKSHEETS ($997 VALUE). TIME TO SHINE IS A 5-WEEK GROUP COACHING PROGRAM DESIGNED TO HELP YOU LOOK AND SOUND AMAZING ON VIDEO, WHETHER YOU ARE FILMING LIVE VIDEOS, WEBINARS, RECORDED VIDEOS, OR EVEN VIDEOS FOR YOUR OWN GROUP COACHING PROGRAM. Queen Chioma Nworgu is an International Motivational Speaker, a TV Presenter, a PR and Media Coach, and a Publicist for Women entrepreneurs and female coaches. She has a Masters Degree in Education and a BA (hons) Degree in Mass Communications and Sociology. She is also a contributor to ‘Thrive Global’ and ‘The Undeniable Life’ Blog. In 2015 she became the Author of the book ‘Festive Success’ (which is available on amazon). She has been on TV over 150 times and she’s also had several features in magazines, newspapers and been on podcast shows and radio shows. She helps her clients to attract the same media opportunities that she has attracted and so much more. Some of her clients have been on the cover of magazines and on amazing podcast shows and TV shows. So far she has spoken at conferences and seminars all over the UK and abroad which includes the UK, Bulgaria, Turkey and Nigeria. Her mission is to teach, speak and heal. Making a big impact in the lives of millions world wide. ☆ Marketing training that I paid $6,000 AND over $25,000 in personal development and years of online marketing experience. After going through Courtney’s 30-day Facebook Live challenge, I knew there was more that I needed. I was missing some technical and professional “magic” and ingredients to really help me come across powerfully on screen. 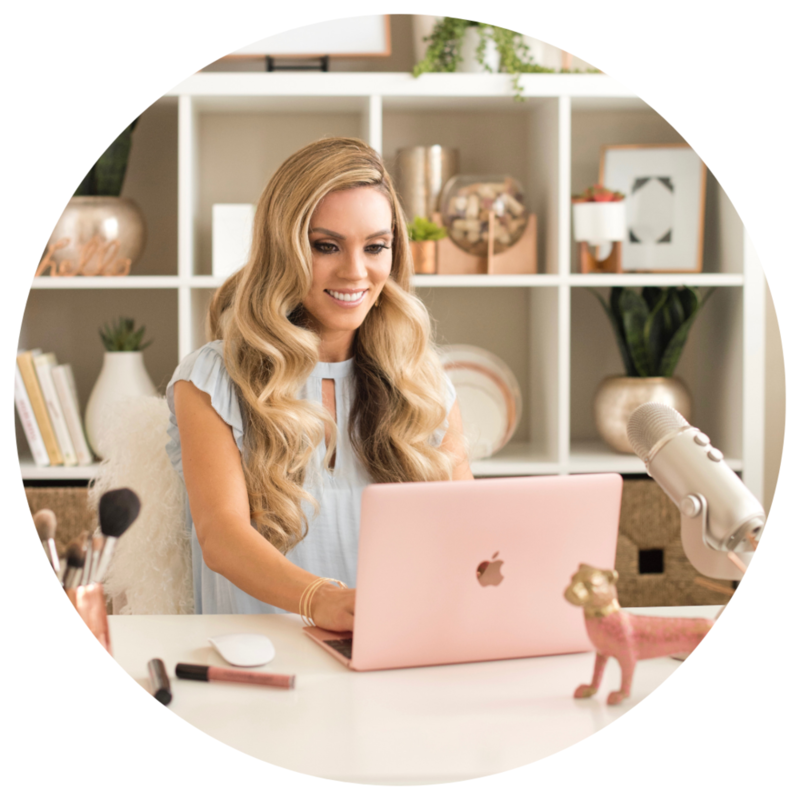 Courtney has been incredibly generous on sharing knowledge on a whole range of things including how to plan your lives, how to create your scripts, what to say, how to give call-to-actions, how to repurpose videos, how to sell from video, how to set-up your tech, how to set up your environment… even things like makeup that will help you look best on screen. And whole lot of other things!